The post So, Your Dog Ate Rat Poison — Here’s What to Do by Sassafras Lowrey appeared first on Dogster. Copying over entire articles infringes on copyright laws. You may not be aware of it, but all of these articles were assigned, contracted and paid for, so they aren’t considered public domain. However, we appreciate that you like the article and would love it if you continued sharing just the first paragraph of an article, then linking out to the rest of the piece on Dogster.com. With a dog who recently had major surgery, I have spent quite a bit of time in emergency veterinary hospital waiting rooms (where our specialist was located). Each time I was in the waiting room, I have seen at least one dog with suspected rat poison exposure get rushed into treatment. If your dog ate rat poison would you know what to do — and what signs to even look for? “Rat poison is very dangerous for dogs,” says Dr. Rebecca Davies, DVM of Firehouse Animal Health Center in Austin, Texas. “They can even die from eating rat poison.” Let’s learn more about rat poisoning in dogs here. Suspect That Your Dog Ate Rat Poison? Some Telltale Symptoms. How do you know if a dog ate rat poison? Photography ©Kosheleva_Kristina | Getty Images. If you even suspect that your dog has gotten into contact with rat poison, seek veterinary care immediately. If your dog ate rat poison, you may notice lethargy, difficulty breathing, pale gums, coughing, vomiting and/or sneezing blood, seizure and collapse. So, Your Dog Ate Rat Poison. Here’s What to Do Next. “If an owner has any suspicion or concern that their dog has eaten rat poison, they should call their veterinarian immediately,” Dr. Davies advises. “The [dog guardian] can also call the ASPCA Animal Poison Control Center at 888-426-4435.” Dr. Davies also says that it is best to consult your veterinarian and/or the ASPCA before trying to make your dog vomit at home. Getting your dog to a veterinarian or veterinary hospital right away should be your first priority. Dr. Davies also notes that it is very helpful for dog guardians to know what kind of rat poison a dog consumed to help vets determine the right course of treatment. Either bring the rat poison container with you to the vet, or know the name of the ingested rat poison. If Your Dog Ate Rat Poison, How Is He Diagnosed? 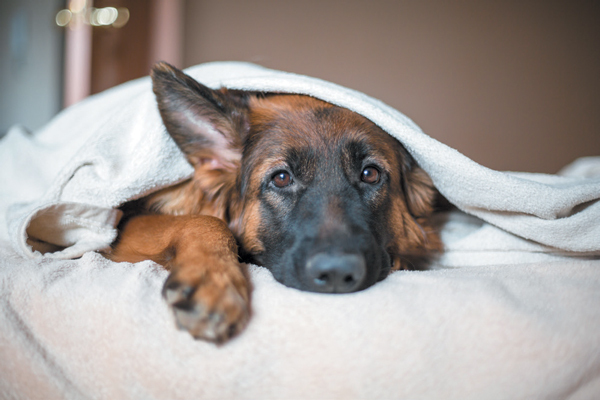 If a dog ate rat poison, Embrace Pet Insurance Claims Manager Rachel Hinder explains that veterinarians will look for clinical symptoms like those described above. They may also take vital signs and blood work. Treatment If Your Dog Ate Rat Poison. Rachel explains that treatment for a dog who ate rat poison varies depending on how long it has been since the dog was exposed to the rat poison. “If caught within six hours, inducing vomiting to minimize absorption is recommended,” Rachel says. “If it has been longer than six hours, vomiting is not recommended.” In that case, veterinarians will likely treat the dog with medications and fluids designed to try and block the rat poison from absorption into the body, and increase flushing the toxin from the body. What’s the Prognosis for a Dog Who Ate Rat Poison? Time is of the essence when it comes to getting treatment if a dog ate rat poison. “Prognosis depends on how long after ingestion treatment is started and how much was ingested,” explains Rachel. Treatment success is very dependent upon receiving professional care ASAP after ingestion. The longer a dog goes without treatment, and/or the more rat poison a dog has eaten, the graver the dog’s prognosis is likely to be. Dogs ingesting rat poison can get very sick very quickly, and exposure can be fatal. What Dogs Are Most at Risk for Eating Rat Poison? While exposure to rat poison is extremely dangerous for all dogs, there are some dogs who are at particular risk from ingesting it. Rachel explains that any dog with underlying medical conditions may experience worse effects from rat poison. In particular, dogs who have kidney disease are especially vulnerable to complications if they come into contact with rat poison. How to Avoid Rat Poison Exposure in Dogs. The best way to protect your dog from rat poison is to keep it away from your dogs. Store rat poison in safe places that your dog does not have access to. Even better — avoid having any rat poisons in your home or on your property and work to prevent rodents from coming into your home or garage in the first place. Keeping storage areas clean, removing all trash on a regular basis, and putting all pet food and human food in sealed containers will help to prevent rodents. If you use rat poison in your yard or walk your dog in areas where rat poison is used (such as in some big cities), always keep your dog leashed and monitor your dog closely to prevent him from picking anything up. If you have an issue with rodents, you can also purchase no-kill traps. These traps are reusable, are more humane for rodents, and also will protect your dog from coming into contact with the dangerous toxins contained in rat poison. If you catch rodents in your live traps, they can be released into fields or wooded areas away from your home. Thumbnail: Photography ©Jannick Tessier | iStock / Getty Images Plus.